Max Horder was one of those young giants who looked destined to take the football world by storm, but never quite got there. Partly that’s because the physical advantages he enjoyed as a youngster became evened out as he played against men, but also because he lost a few important years to the Second World War. The buzz about Horder had started to build when he was just 16. He’d played some footy with the Hawthorn Colts (a pre-cursor to the under-19s) in 1939, and by the 1940 pre-season he was training with the seniors, even playing in some of the ‘probables v possibles’ practice matches. In March of 1940, The Herald reported that the coach of Hawthorn’s seconds side, Tom Byrne, was “especially pleased with the possibilities of Max Horder”. Horder then stood 6ft 1in and weighed 12st as a 16-year old, and had played for the Victorian schoolboy side in 1939. While with the Hawthorn Colts in the same year he had come under the tutelage of Len Thomas, and he enjoyed further grounding with the Hawks in 1940. But progress was slow after that year, and for two years his career stagnated. Then in 1943 he enlisted, having spent time before then with the Victorian Scottish Cadets. Horder trained at Puckapunyal and in NSW, and served in New Guinea, where his Batalion fought against the Japanese. While there he contracted malaria and suffered major skin problems, and was deemed unable to continue fighting in the humid climate. He returned to Australia and was discharged late in 1946. 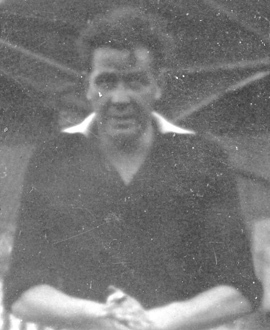 He returned to football with Ivanhoe Amateurs and it was from there that Collingwood recruited him for the 1948 season – nine years after his first taste of VFL footy with Hawthorn Colts, and at a time when he must have thought his chance of a second crack at League footy had long gone (although he was still only 25 when he made his debut). But the Magpies were drawn by his size – he had filled out even further by the late 1940s and now weighed over 14 stone – and by the obvious ability he’d shown as a schoolboy footballer. Horder was a ruckman, of course, but also very handy around goals when resting in a forward pocket. He was pretty rough and ready as a footballer, but a willing competitor in the rucking contests, a useful mark and a solid kick (especially for goal). Sadly, he din’t get many opportunities at Victoria Park. He played six games in the 1948 campaign but started on the bench in almost all of them. And in those days, that meant you really only came on if someone got injured, or for ‘fresh legs’ in the last quarter. In one of the few he started on the ground – just his second game, against St Kilda – he kicked two goals but was dropped back to the bench the next week, then out of the side altogether the week after. He just never got a decent run of senior game time. Horder did play 15 games with the seconds, and did enough to regularly feature in discussions around senior selection, sometimes being named among the emergencies when he wasn’t on the bench. But it was still no surprise when the Pies let him go at the end of the year, his final contribution as a Magpie having been as part of a team that played North Launceston in an exhibition match at York Park after the 1948 season had ended. He spent the next two years with Brunswick in the VFA, though his effectiveness in the first year was limited by frequent absences through work that often took him into the country. In 1951 he crossed to Preston, and then later played in the country with Wodonga and Benalla. Wherever he went, the big-bodied, big-hearted Max Horder played with the same endeavour he’d shown while serving his country against the Japanese. And that was plenty.